Left to right: Casey Robbins, Fred Pitts, Damaris Divito. Photo courtesy Palo Alto Players. Clybourne Park is difficult to classify in terms of “comedy” and “drama.” The play, especially the second act, finds humor in the discomforts of racial tension, but is underscored with the characters’ essential humanity and desire for some amount of dignity in their life. Nobody in this play is a saint, but nobody is irrationally cruel either. Palo Alto Players’ rendition, directed by Jeanie K. Smith, uses brilliant staging to illustrate the subtleties of this challenging, multileveled play. The first act, taking place in 1959 in the middle-class white Chicago neighborhood of Clybourne Park (mentioned during Lorraine Hansberry’s Raisin in the Sun), uses many of the same beats as the dramas of the 20th century. It centers on white couple Russ (Todd Wright) and Bev (Betsy Kruse Craig), torn apart by recent family tragedy and contending with neighbors trying to stop them from selling their house to the black Younger family. Smith’s direction organizes the characters and their numerous subplots into understandable units, making the complex maze of relationships clear to the audience. Wright’s performance as Russ – a weary man battling the recent loss of his son – is spectacular, measuring up to some of American theatre’s greatest patriarchs. In an act where almost every character’s true intentions are obscured by a barrier of politeness, Russ’ motivation is clear – he wants to leave. This clarity of action makes him more sympathetic than Jim (Casey Robbins), who wants to sweep tragedy under the rug, or Karl (Michael Rhone), who cares more about keeping the neighborhood white than about his neighbors’ pain. Caught in the crossfire are Francine (Damaris Divito), Bev’s black housekeeper, and her husband Albert (Fred Pitts), who have no particular investment in the drama – Francine has somewhere she needs to be – but end up being used as props in everyone’s argument. Albert is by far the funniest character in this act, occasionally stepping in with a piercing remark that deflates the tension the other characters have painstakingly built up. 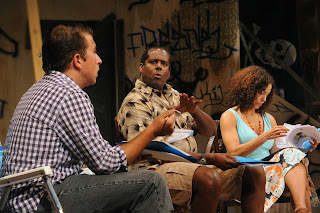 The art of the one-liner is difficult, and in Clybourne Park, Pitts proves that he is a master. The second act, set 50 years later in what has become an increasingly gentrified black neighborhood, retains much of the previous act’s structure but presents itself as a modern comedy. Michael Rhone and Kelly Rhinehart play Karl and Betsy, a white couple seeking to tear down the house from the previous act, but who have run into opposition in the form of black housing board representatives Kevin and Lena (Pitts and Divito). In this act the web of relationships is simpler, the veneer of politeness is more fragile, and many of the characters are less sympathetic. Divito’s acting as Lena is superb – she’s singularly focused on protecting her family’s legacy and Clybourne Park as a community, and although she plays along, she quickly stops putting up with Karl and Betsy’s sheer ignorance of the problems they cause. Her performance is powerful but reactive; she doesn’t want to get dragged into a fight, but she can more than hold her own. Clybourne Park is an intelligent, funny, well-written play about the way people skirt around uncomfortable issues of race and privilege, and how the artificial constructs of polite conversation crumble when faced with reality. Solid acting from the entire company and smart direction make this play a community theatre gem and an absolute must-see.